Join the Lakewood Neighborhood Dinner Club. Join the Lakewood Neighborhood Dinner Club. We offer two complete seasons of family styled dinners, both Fall and Spring...Mom's Bacon Topped Meatloaf, Garlic Parmesan Crusted Chicken, Spice Rubbed Pork Loin, Green Chile Triple Jack and Mac, French Onion Mashed Potatoes, Pumpkin Enchiladas, Chocolate Bourbon Pecan Pie. Got your attention? 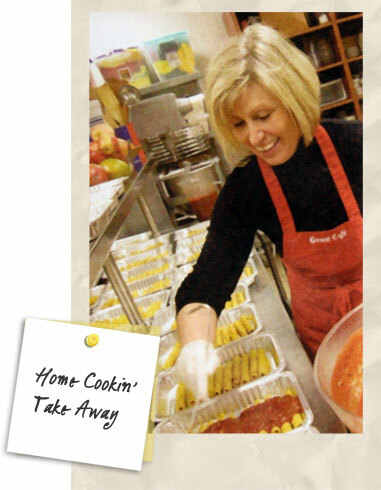 Meals are prepared fresh, never frozen, and are ready for heating with simple to follow warming instructions. Each meal includes an entree and two side dishes. Order by Monday and pick up on Thursdays. It's as easy as biting into a morning glory muffin! Designed for busy moms, for gift giving and for folks that love the taste of home cookin'! A different homemade dessert is available each week, too!